← Blog 117. Barking up the wrong tree? Blog » Blog 118. Can Arctic Ice Cool Your Cocktail? How come the scientific news seems flooded (as it were) by the melting of arctic ice? After all, is the arctic really melting? Should we believe all of the alarm over a little cold water? Let’s look at the data. Here’s* a plot of the volume of ice in the arctic, as measured near the annual minimum and maximum (September and April)**. Since 1980, the annual maximum has dropped about 25%, while the annual minimum decreased by 75%. That minimum suggests the arctic will soon be ice-free in the summer. The area of ice (not shown) gives a similar message: in March of 2017, arctic sea ice reached its maximum annual extent, the lowest in the 38-year record. So what? Maybe our grandchildren will go swimming at the north pole. The situation isn’t quite that rosy, for more reasons than the lack of a sandy beach at the top of the world. Due to various positive feedbacks, the arctic presages climate change like the canary presages gas in a coal mine. Among other things, the exposure of more arctic land mass during each summer absorbs increasing amounts of solar energy. Heating the bare land alters global air circulation. Furthermore, the melted ice raises the global sea level and can upset the oceanic circulation. And it’s expected that thawing the tundra will release methane, a greenhouse gas more powerful than carbon dioxide. What’s the fundamental cause of all this? The underlying cause of climate change is the radiative forcing, the difference between the solar energy absorbed by the earth and the infrared energy that earth radiates back out to space. If the radiative forcing increases, then, the global temperature MUST gradually rise until the rate of heat radiated equals the rate of gain. 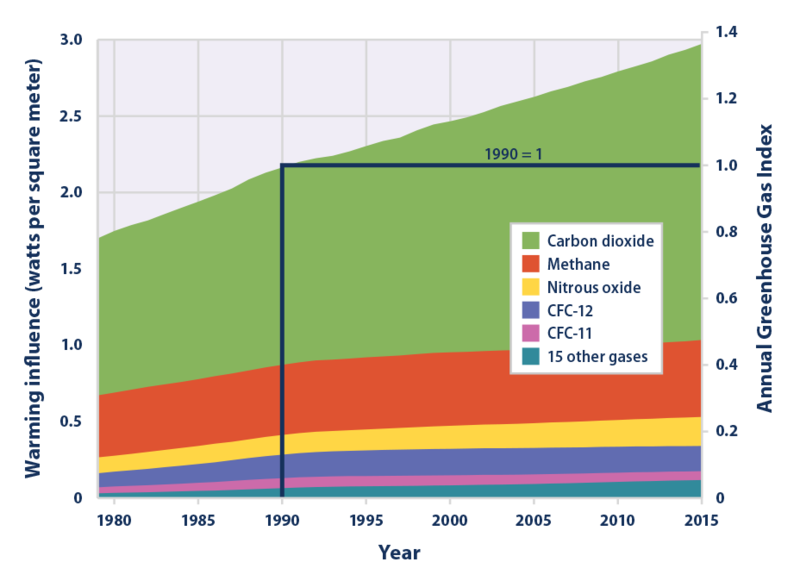 Here’s a plot of radiative forcing due to the accumulating greenhouse gases in the atmosphere. 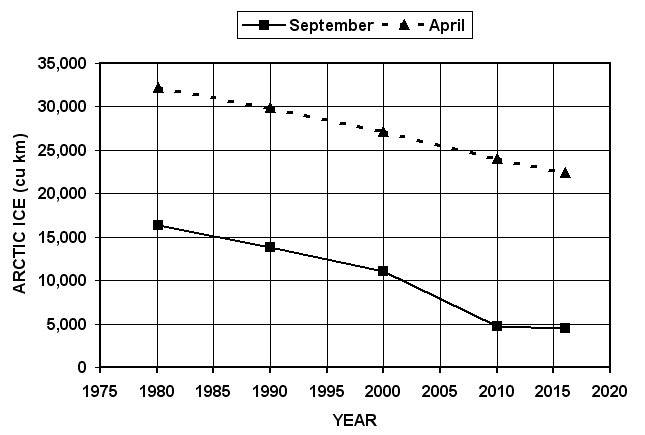 The right axis shows the relative change since 1990. The left axis shows the radiative forcing in watts per square meter. If there were no feedbacks (like melting of the ice, desertification, and cloudiness), an increased forcing of 1 Watt/m2 would induce a temperature change of about 1/3°C (1/2°F) . As the alarm-call of the shrinking ice volume confirms, it’s the positive feedbacks that make the warming effects worse. When the data are so simple, why the denial? Why the war on science? When couched as blame, falsehoods strengthen the bonds among members of an identified group, especially during intergroup conflict. Denial of truth thrives in an atmosphere of anger, polarization, and the “Politics of Resentment.” People don’t join a political movement for logical reasons, but for other reasons that we’ll explore in the next blog. Anyone who thinks the anti-science movement will reward his/her group, anyone who thinks the polar meltwater will forever cool his beer, had better recognize two truths. One is the physical truth of disastrous climate change. The other is the historical truth that societies collapse due to severe inequalities of wealth and opportunity, a situation that fosters illogical revolution. * The graphics show properly in the on-line version, but might be displaced by receipt on portable media or by settings in your individual browser. ** Data from Scientific American magazine, February 2017, p. 17. This entry was posted in Blog, Complex systems, Governance, Ideology, Science & society and tagged anti-science, arctic ice, climate change, CO2, complex system, data, global warming, inequality, politics, science wars. Bookmark the permalink. Lewis postulates that terrorists choose the most powerful enemy they can find as a way of garnering for themselves the implied power of the foremost enemy of wrong. But, points out Lewis, this is a facade. When the Great Satan, for example, fades, the terrorist doesn’t rise to claim first place, rather he chooses a new enemy. If this is true for the enemies of science, it provides some “cold comfort” [get it? hahahahaha] for science — the implicit power of being in first place. Yes, analogizes Yeamans, the healthy cells have the moral victory over cancer cells but they might lose the practical war anyway.